PARTICIPATE IN JAN'S YOUTH ESSAY COMPETITION TO WIN 100,000 NAIRA AND MORE! 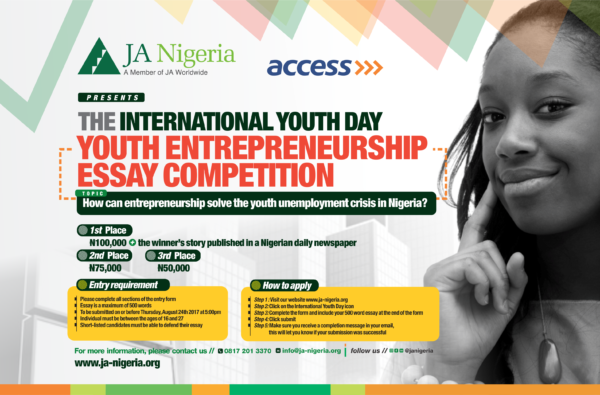 To commemorate International Youth Day, Junior Achievement Nigeria is organizing a “Youth Entrepreneurship Essay Competition” in partnership with Access Bank. Step 5: Make sure you receive a completion message in your email box; this will let you know if your submission was successful. Please note that essay submissions will close on Thursday, August 24th, 2017 at 5:00 pm. The winners will receive cash prizes ranging from 100,000 Naira to 50,000 Naira, a chance to publish their articles in a Nigerian daily newspaper and the opportunity to represent Junior Achievement Nigeria at a youth entrepreneurship forum. If you have what it takes, you could be one of the lucky winners. Submit your essay today! The Junior Achievement Essay Competition, sponsored by David M. Rubenstein, was founded in 2008. Each year, high school students in Greater Washington are invited to write an essay and compete for over $110,000 in college scholarships. A first, second, and third place winner will be selected from each of Maryland, Virginia, and the District of Columbia, and will be each awarded a $10,000 scholarship. The scholarship must be applied to higher education expenses. Applicant must be a citizen or legal resident of the United States. Immediate family members of judging committee members and of Mr. David Rubenstein are ineligible for this essay competition. Immediate family members of employees of Junior Achievement, the Board of Directors of Junior Achievement, the Associate Leadership Council of Junior Achievement, and the Montgomery County Advisory Council of Junior Achievement are also ineligible. 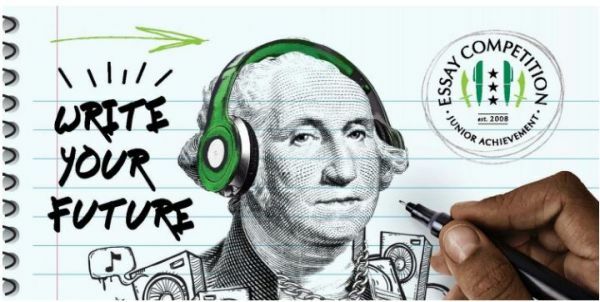 Grand Prize winners from any prior Junior Achievement Essay Competition are ineligible for this essay competition. Any applicant who has been previously disqualified from a Junior Achievement competition is ineligible for this essay competition. Each applicant may enter only once and may only provide one essay on the topic. “Entrepreneurs have been around since the very beginning of our country’s history. Their contributions to society are as diverse as the backgrounds and personal experiences of these men and women. Essays must include the Applicant ID Code assigned by Junior Achievement in the upper right corner of each page. Applicant ID Codes will be automatically assigned after the completion of the first step of the online submission process. Essays must be the original work of the applicant. Essays must neither have been entered in another competition nor have been published previously in any form or sold for publication. Essays must not contain material that infringes on the intellectual property rights of others. Any essay that violates these rules will be disqualified and any awards made for such essay will be rescinded and must be returned to Junior Achievement. All essays will be checked for plagiarism by Junior Achievement with SafeAssign by Blackboard. A first, second, and third place winner will be selected from each of Maryland, Virginia, and the District of Columbia. Additionally, one grand prize winner will be selected from among all three regions, for a total of ten winning applicants. The grand prize winner will receive a $20,000 scholarship. The first, second, and third place winners from Maryland, Virginia, and the District of Columbia will each receive a $10,000 scholarship. All winners will be invited to attend a private awards ceremony in spring 2017 and will have their essays published on Junior Achievement’s website. Winners will be announced on myJA.orgin spring 2017. In each of Maryland, Virginia, and the District of Columbia, the school with the greatest number of eligible applications will receive a $6,000 grant, for a total of three winning schools. Applicant must submit his or her essay to Junior Achievement between September 26, 2016, to January 23, 2017. Essays received by Junior Achievement after 11:59 p.m. on January 23, 2017, will not qualify and will not be considered. contact Sarah Dohl, Vice President of Communications, at (202) 777-4482 or Sarah.Dohl-at-JA.org.